Sardar Vallabhbhai Patel Institute of Technology (SVIT) Recruitment 2017 | Principal Posts : Sardar Vallabhbhai Patel Institute of Technology (SVIT) has published Recruitment notifications for below mentioned Posts 2017. More information please read below mention officially notifications carefully. 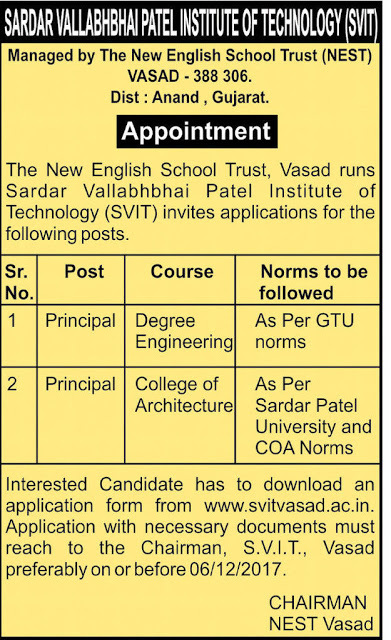 Address to sent Applications: The Chairman, Sardar Vallabhbhai Patel Institute of Technology (SVIT), Vasad - 388 306. Dist: Anand, Gujarat.